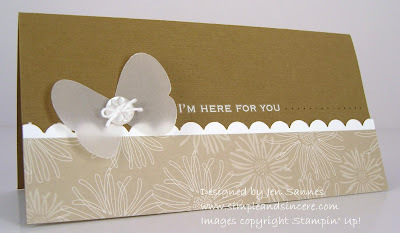 Sympathy cards are some of the hardest cards to make, and this is the type of card that would be easy to make up a batch to have on hand to share with your loved ones when needed. For some reason, Splitcoast has been having some uploading issues tonight, so I resorted to posting my card here instead of my SCS gallery. I'll try to upload again in the morning, but for now, I'm off to bed. Have a great Sunday night - I'll be back tomorrow with another card for this challenge. Stunning card! Love the vellum butterfly! OMG, this is beautiful, Jen! The color is perfect and so is the butterfly. oooo, very nice! love the touch of vellum, always the perfect softness. What a lovely card - the vellum butterfly is beautiful along with the piercing! Beautiful! What great use of the butterfly punch. Wow! Great CAS card that could be made in a variety of colors and occassions. Love your blog and all of your posts on SCS. What a great CAS sympathy card. This reminds me of the Seinfeld episode where Jerry and Elaine keep saying "I'm here for you..." to the couple that are divorcing and Jerry and Elaine want to get first dibs on the newly eligible. Hee hee. :) I think Jerry and Elaine would have loved to have sent this card!